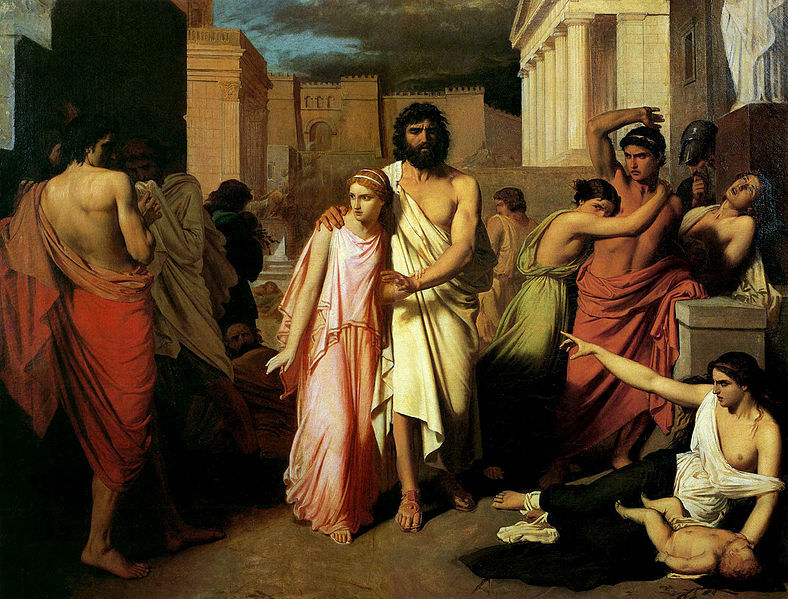 Antigone was a daughter of Oedipus in Greek mythology, and a reoccurring figure in the works of Sophocles, where Antigone was depicted as a strong woman standing up for what she believed to be right. ​Antigone was born of the incestuous relationship between Oedipus and Jocasta, for unbeknownst to the pair, they were mother and son. This relationship would bring forth four children, Polynices, Eteocles, Ismene and Antigone. ​Oedipus would rule the city of the Thebes, but when his crimes were discovered, for he had unwittingly killed his father, as well as slept with his mother, Oedipus would be exiled from his kingdom by his own sons. By this time Oedipus had blinded himself, and as he went into exile, Oedipus would be guided by Antigone, and perhaps Ismene. The blind Oedipus and Antigone would eventually find refuge in Colonus, a deme of Athens. ​Here, Oedipus was visited by Polynices, for the brother of Antigone, now sought his father’s assistance, for a war was imminent between Eteocles and Polynices, but Oedipus cursed his sons to kill themselves. Polynices seems to have been the favoured brother of Antigone, for Antigone would try and convince her brother that no good could come from a war between brothers, but the words of Antigone were to no avail. Oedipus would die in Colonus, and now no longer required as a guide, Antigone returned home to Thebes. ​Antigone returned to Thebes at the time of the war of the Seven Against Thebes, where Polynices and his allies sought to wrest the throne of Thebes from his brother. The war was a disaster for all sides though, and ultimately the words of Oedipus came true, for Polynices and Eteocles did indeed kill each other. When the fighting had ended, Creon, who was now regent of Thebes once again, enacted a new law, which forbade the burial of those who had attacked Thebes. Thus the brother of Antigone, Polynices, lay unburied upon the battlefield, and without proper funeral rites, the soul of Antigone’s brother could not pass into the Underworld. ​Antigone thus decided to ignore the new Theban law, and in the darkness of night Antigone buried Polynices, although some say that Antigone built a funeral pyre for her brother. Ultimately, Antigone was caught breaking Creon’s law, and Antigone was thus brought in front her uncle, where she admitted knowing about the law and ignoring it; for in her defence Antigone argued that divine law, or the law of the gods, was to be put ahead of any man made laws. Despite her impassioned defence Creon has no sympathy for his own niece, and has Antigone locked in a tomb, where of course she will die. Shortly afterwards, Creon changes his mind about the punishment meted out to Antigone, and decides to release her, but when the tomb is opened, Antigone is already dead, for she had hung herself. This is Sophocles’ version of events, but other writers told other tales of what occurred after Antigone had disobeyed Creon’s law. ​The story of Antigone, as told by Hyginus, tells of how Creon orders his son Haemon to execute Antigone; Creon being unaware that his son is secretly engaged to Antigone. Haemon of course does not kill Antigone, but instead hides her away in a farmstead, where Haemon continues to visit Antigone, long after Creon believes her to be dead. ​Antigone thus gives birth to a son by Haemon, a son named Maeon. Years pass, and Maeon grows up, but when Maeon enters the city of Thebes, Creon recognises his own grandson, for Maeon is marked by the Spartoi symbol of the dragon. Realising that his son had disobeyed him, and that Antigone is still alive, an angry Creon calls for his previous orders to be enacted. Despite the intercession of Heracles, Creon refuses to back down, and so Haemon kills Antigone and then kills himself. ​There was a version of the tale of Antigone in antiquity which had an altogether happy end for Antigone, a version given in the now lost work by Euripides, entitled Antigone. In this tale, Haemon has been a party to Antigone’s burial of Polynices, and so Antigone and Haemon are both sentenced to death. Before the pair can be executed though, the Greek god Dionysus intercedes upon their behalf, with a greater level of success than Heracles, and the words, or threats, of Dionysus are sufficient to have Creon’s order rescinded. Thus, Antigone and Haemon live out their lives happily, becoming parents to a son, Maeon.